Both the EL and the LED sabers can utilize specially made hilt components collectively called the Modular Hilt System. This system consists of screw together CNC machined parts that interchange to allow you to swap out grips, emitters and pommels for a wide number of possible combinations. Each piece is sold separately, so if you wanted to have one saber with the ability to change its look, you could just buy an extra part to swap out and you'd have a new looking saber without having to invest in an entirely separate saber. PLEASE NOTE: In order to have a functional saber, you will have to have A: a blade holder; B: a pommel, and C: some sort of center cection to house the electronics. Also please be aware that some of the center sections DO NOT come with a hole for mounting the switch assembly. Some are meant to serve as extensions or grips and therefore do not come with switch holes. So if you do not see a switch hole in the picture, it's probably not there. We do however offer a switch hole machining service should you wish to have a hole made in a custom location or on a piece that does not normally have one. By using a quick connector setup the MHS system also allows LED sabers to quickly swap out LEDs by simply unscrewing the emitter, disconnecting the quick connect and removing the LED, which is screwed down to a heatsink. You then just replace the LED/heatsink combo with another one in a different color, reconnect the quick clip and screw the emitter back down again. The whole process can be done in under a minute. Please click on the picture to open new window with larger picture and item description. These are the only 5 pieces that come with switch holes as a standard feature. All of the above parts have an outer diameter of 1.45" and an inner diameter of 1.25"
Note that these grip sections now come with two different switch style options. There is the "standard" switch and the lower profile "guarded" switch. These can be found in the store in both momentary and latching types. The "guarded" switch is much deeper than the "standard" model. Most blade holders have an outer diameter of 1.45". The exceptions are the ones that taper to a point or the flanged emitters. However, all of these START at 1.45"
We offer a safety plug for your sabers as well. This crystal-looking plug goes in the blade holder of your saber, so that you can't blind someone when you turn it on without a blade. All the pommels but the style 3 and 7 have a max outer diameter of 1.45"
All the pommels are now modular. There are 9 inserts that you can secure with a C-Clip or rubber O-ring or glue. These vary in style from just a basic flat disk to a speaker grill with a recharge port hole in the middle. Click on any of the pictures for a more detailed description and a bigger picture. There are also some pommel styles designed to have a switch mounted in them. They are not compatible with the Modular Pommel System. In parenthesis are the switch types that the pommel is meant for. Here is a dual ended pommel for screwing two MHS sabers together. The staff is made from a pair of Style 1 hilts, a pair of Style 7 emitters and a matching set of MHS ribbed extensions. This double male adapter is made for use in conjunction with speaker(s) or a lighted crystal chamber. This would make a dual ended saberstaff, like this one. 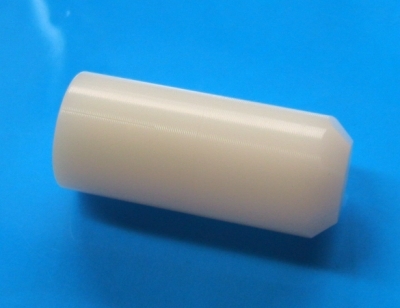 Ribbed extensions have a max outer diameter of 1.45" and a inner diameter of 1.15"
The max OD of the choke points is 1.45" and the ID is about .8"
These parts can be used to extend the length of your saber by anywhere from 2" to 10". These do NOT come with a switch hole machined in them. If you would like that, utilize the Machine Switch Hole service. You will likely need to use one of the double male connectors (pictured above) in conjunction with these parts. All of these extensions (except the 4" grooved) have an outer diameter of 1.45" and an inner diameter of 1.25"
We now offer attachments for MHS pieces that turn them into tonfa-styled sabers. To attach these extensions, first you must buy the Tonfa MHS adapter. This bolts onto a MHS hilt piece. It can not go onto an emitter or a pommel. Stick with the basic hilt sections. There are two bolt holes and then a center wire hole. Then get one of the tonfa extensions. Lastly, get a tonfa pommel. IMPORTANT: ONLY tonfa pommels work with the extension. You can not use a regular MHS pommel with one. We also offer trim rings for the Tonfa Pommels. These help give a good grip and make the handle seem more like a handle than just having a rounded end on it. Using the tonfa extension style 1 and the tonfa pommel style 1, you can get a saber like this. We now offer, in addition to the standard and low profile switches, Vandal switches. These are too deep for a normal MHS hilt, but look very cool. 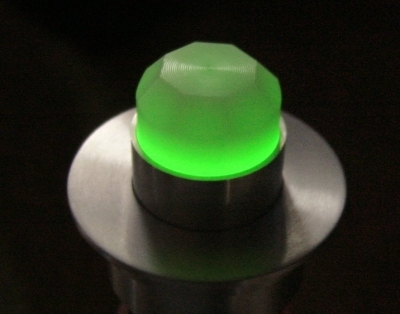 We have made a few different parts that allow you to use a Vandal switch in your saber. These switches are also illuminated! They come in both momentary and latching flavors. We now offer trim rings that are sandwiched between two MHS pieces. These help break up the hilt and make it seem less like a tube. Make sure not to use these on the blade holder or on the pommel (if you are using a speaker holder) as the ring will mess up the fitment. MHS Sleeves are designed to slide over the standard hilt sections (ones with an OD of 1.45"). They can be mounted with epoxy or with screws that are tapped into the hilt. The Sleeve Material can be cut to shape with a dremel, giving you nearly infinite possibilities. Please note that your LED saber can utilize our modular LED electronics kits to make assembly much faster and easier. You can build an entirely custom LED saber by using the MHS builder. This computerized system allows you to mix and match different grip, emitters, pommels and extensions and VISUALLY SEE what they would look like BEFORE you buy. It even calculates overall length and cost for you automatically. Please be aware that a 5 watt kit will not fit into a standard 3 piece MHS hilt because of the space needed for the 6AA battery holder. You CAN run a 5 watt in a simple 3 pice MHS setup with a 9V battery however. The only down side to this is that you'll not have as long of a "run time" as you would with 6AAs. We offer AA and AAA rechargeable battery packs that fix the 9v issue with the 3 piece hilt. We are looking for any input on further setups with the AAs if anyone wants a different design or voltage than what we offer. See how the MHS goes together in this tutorial. If you ever experience difficulty with screwing two MHS parts together, or getting them apart, please read the Dealing with stuck or difficult MHS threads section. Last edited by Lord Maul; 07-07-2011 at 10:40 PM.